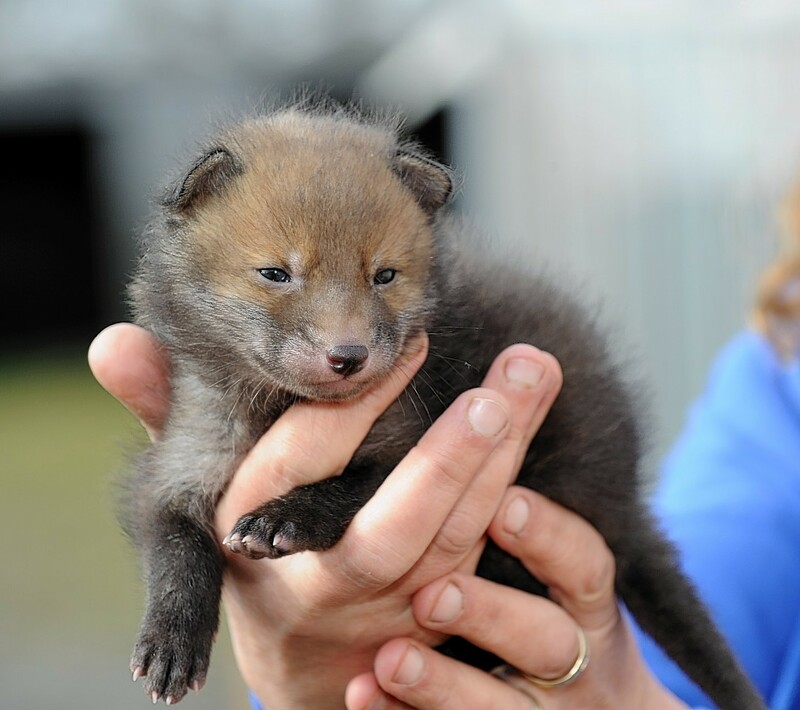 Fidget the fox cub at three weeks old at the New Arc Centre, Auchnagatt. The “re-wilding” of a seven-week old fox cub found during an Aberdeenshire Easter egg hunt has started after he found a new home in the west of Scotland. Fidget was aged just three weeks when he was discovered by youngsters during the hunt on a farm near Inverurie and taken into the New Arc animal rescue sanctuary at Auchnagatt, near Ellon. However, when no fellow fox cubs arrived to keep him company, the centre’s owners Keith and Pauline Marley made the decision to take him to Hessilhead Wildlife Rescue at Gatehead in Ayrshire. Mr Marley said yesterday they had been left broken-hearted after parting with the baby fox, but feared that without fellow cubs for company he would become too tame and unable to fend for himself in the wild. Mr Marley said: “We took Fidget down to Hessilhead where they had young foxes, it is a shame but it is one of these things. “If we had had other foxes hen it would have been a joy to see them learning all together. These things break our hearts sometimes. “It was just last week we took a trip down together with him in the back of the car. Fidget’s “re-wilding” has started with workers at Hessilhead preparing him for life in the great outdoors. Andy Christie, co-founder of and trustee of the Ayrshire centre, said they were currently catering for ten fox cubs, while the centre has about 3,500 “patients” per year. Mr Christie added: “I think he is quite happy. At the moment he has not really changed his behaviour, he’s eating and doing what he should. “He is with one other fox at the moment because he was pretty tame having been used to people for so long. The orphaned cub is thought to have wandered too far from the den and got lost, or have been abandoned by his mother.